Candide: You taught a design seminar together called “Findlinge” [Erratics] as well as a studio project called “Dramatyp” [Dramatype]. It is easy to see how “erractic” [ . . . ] would refer to existing buildings, especially since in German the word also alludes to “found object” and “remains.”?[ . . . ] What exactly [do you mean by “dramatype” in architecture]? Jörg Leeser: We use dramatype as an analogy. It is a term some biologists use along with the terms genotype and phenotype. Dramatype describes the immediate reactions of an organism to its environment. In contrast to a genotype, which constitutes the genetic predisposition of an organism, and a phenotype, which is the observable characteristics of an organism, including the ways it is modified during the course of its lifespan, a dramatype is a direct response of an organism to a particular situation. Dramatypes are fickle by nature. Urs Füssler: [ . . . ] [One can understand] the city as a biological organism. A city’s buildings are built over the course of time in response to each other. And the seminar title “Findlinge” refers to our penchant to think about and work with existing buildings. 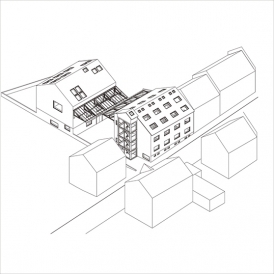 In this sense, the two terms are paradigms that are key to our design philosophies and lay at the base of our joint teaching program: that architecture in the city, first, works with and responds to what is there, and, second, is something that is always changing and transforming and adapting, resulting in collisions and conflicts. C: In the blog that you set up and used as a tool for the seminar and studio, but also in your lectures, language and terminology play an important role. In your teaching you use terms like dramatype but also choose verbs to describe the possible design interventions of your students, such as declutter, dismantle, perforate, weave in, pile on, slide in, grout over, paint. UF: The established vocabulary [ . . . ] frequently fails to describe what architects do with existing architecture. This is why our design practice includes coining new terms that enable us to talk about what it is we are doing. We try to slightly alter the meaning of certain terms used in the discourse through the way we use them. C: Could you explain how you conceptualized as well as experienced the relationship between analysis and design in the studio and in the seminar? JL: [ . . . ] The “Findlinge” seminar and the “Dramatyp” studio [were] both dealing with the same issues but in very different ways. For the seminar the final product [ . . . ] was one single image of an architectural setting. Through this image, we wanted each student to generate an architecture, which, while originating from built reality, would transform this reality into a possible built reality. [ . . . ] While the seminar participants were required to use only visual, two-dimensional means to engage the perceived properties of their sites, students partaking in the studio were also asked to operate in three dimensions, addressing further issues such as a building’s structure. They were required to work with architectural forms of representation: black-and-white drawings drawn to scale, with pre-determined line weights and a standardized axonometric projection, floor plans, sections . . .
UF: . . . the drawings as a form of abstraction and a way to list the things the students had taken note of, like creating a vocabulary for a picture dictionary. UF: [ . . . ] We took a stroll with the students as an exercise in collectively contemplating the city, and then speculating about what could be done with it. It did not take long before there were sites where students called: “Over there! Check it out!” Another would say: “Do you know this place? Totally relevant!” As a result, our stroll did not follow a fixed path, but was determined by constantly being led astray. This method was highly enjoyable, like a game, an architectural game that involves meandering, pointing, exchanging ad hoc ideas about what could be done with a particular place, improvising architecturally. In order to learn how to speculate in this way, strolling is fundamental. JL: The visiting professorship in Wuppertal was an opportunity for me to return to places where I spent my youth: Essen, Wuppertal, Heiligenhaus. I wanted to use and describe the narrative potential and intensity of these places. The chair I was asked to fill on an interim basis was called “Bauen im Bestand” [Building within Existing Structures]. If you take “existing structures” to include everything that is there, from spectacular to unassuming, from ruinous to new and ugly, then it must be possible to pick up on and develop the qualities of these places architecturally by working with the existing structures. UF: When I studied with Fabio Reinhart and Miroslav ?ik at ETH Zurich, we discovered the importance of urban peripheries. The analogies and references we used in designing buildings were no longer the icons of architectural history—still a subject of postmodernism at the time—but rather anonymous architecture, often industrial buildings. “The Lindner,” Werner Lindner’s book Bauten der Technik, was one of our bibles. When I moved to Germany, I got to know cities that were utterly foreign to me, at first Frankfurt am Main and Kassel, and later Berlin. I learned to see the city in a new way: not as a beautiful, finished object, but as an evolving organism, interspersed with vacant sites invoking architectural intervention. The Wuppertal films by Wim Wenders, Tom Tykwer, and Benjamin Quabeck depict very specific views of this city. And Jörg Leeser talked about Wuppertal. He sent a stream of photographs of things he wanted me to see. This is how the city became familiar to me from a distance, even before the semester began. JL: One of the key influences on my approach to architecture and the city was Peter Eisenman’s thinking on semiotics. He sees architecture as a discipline that engages language as a means to understand the process of its coming into existence. Later I broadened the context of Eisenman’s ideas by contemplating and incorporating melancholy, the city and its history, and the ordinary and the everyday. Because of our different backgrounds, working closely with Urs on a studio and seminar was exciting and unpredictable. C: [ . . . ] Together with your students, you combed through the area along the floating tram, taking note of the things you saw. To what extent did prior knowledge of what you saw influence the students’ search for suitable sites and the development of their projects there? Knowledge of postwar urban planning, the processes of modernization and rationalization trends, building materials? How did you link observations with knowledge? UF: We both accumulated baggage during our studies, while working for architecture firms and on our own, as well as through teaching. We both have backpacks, and we cannot simply cast them aside. But we would like to think that the contents of these backpacks are diverse enough for us to develop our teaching in response to our students’ ongoing discourse, and in a way that the outcome of the students’ work remains unpredictable. If we ever tried to impress our students we did so not by displaying our knowledge, or because of the contents of our backpacks, but by our unanimity in front of some obscure building demanding that they really look at it! UF: This process was interesting for us as well. And since the close study of the city developed its own dynamic, it happened very quickly. All of the sudden, the students had plans. And these plans included things that are normally omitted but which are useful as inventories of particular situations: lamps, advertisements, and so on—micro architecture. JL: We introduced and discussed all sorts of perspectives, ideas, and references with the students but we wanted to free them from the burden of having to come up with ingenious designs. We told them, “Think like a craftsman! How wide is something? How large is it? What should it contain? Does it need a window?” [ . . . ] We wanted the students to develop their projects free from the imperative of design ambition. C: It is interesting that students had to not only find a site to develop, but also to imagine a client and then design an architecture that would fit the client’s needs and desires. So it’s no longer just about buildings, but about a plot. [ . . . ] Were there scenarios that would have gone beyond the scope of the project or that would have been unsuitable for Wuppertal? What were the ground rules that you set? JL: We wanted to get the students hooked on the ordinary and the everyday processes of architecture. We wanted to point out possible real-life scenarios that happen in Wuppertal: homeless shelters, churches, a company that provides security guards. By looking at this normality, the students’ programs evolved from the sites. JL: For example, gucken—the act of looking, watching, examining— [ . . . ] [like our view on Wuppertal,] is a practice that anyone can cultivate. JL: In retrospect we ask ourselves: What characteristics made Wuppertal into a city that we could successfully build on and add on to? JL: The failure of architecture in the city goes hand in hand with an optimism that is implicit in even the deepest melancholy. This was the moving force for us in Wuppertal. Are we dependent on a form of architectural decay that moves the heart in order for a new form of architecture to blossom? UF: Of course, when we work with what is already there, there is always an element of destruction. JL: As architects, we are constantly faced with the problem that in working on existing buildings we expose traces of their past. These, however, will most likely be effaced by our very work on the building. To what degree do we need to hold on to these traces? And to what extent are we able to confront history without confronting the pain of history? For me this is a central and difficult question. C: The idea reminds me of a teaching method Hermann Czech used when he was a visiting professor at ETH Zurich. Every student had to bring an existing project for another student to redesign on the basis of entirely different programmatic specifications. UF: Wow! We didn’t know that. The question then is: how do I design something knowing that one day it will either be demolished or used in other ways or even be embalmed by preservationists? 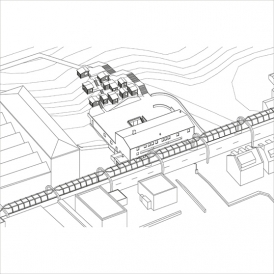 Can I build in contingencies that give me indirect control of the future of the building? This kind of self-reflection is integral to literature und filmmaking. In these disciplines, the creator tries to take into consideration not only the story and its protagonists, but tries to imagine the thoughts going on in the viewer or reader’s mind. Any good crime story plays with the reader in this way or sometimes, as in Michelangelo Antonioni’s Blow-Up, such self-reflection is part of the narrated story. We don’t have this in architecture. Architects [ . . . ] do not think further. They point to their architecture and say: this is it. [ . . . ] They have their buildings photographed—preferably uninhabited—[and] [ . . . ] want to preserve their buildings in an idealized, present state. This is to prevent any possible change to the buildings, imagined or real, from the outset. A better way of representing a building would be to show how the architect imagines the design after it has been messed up by its users or by other architects, showing that despite all sorts of interventions, the building still has value. Or for the architect to show how the design might stimulate others to create something new. Wouldn’t an architecture that confronts these issues be ideal? C: Underlying your approach is a critique of the contemporary practice of historic preservation. Typically, preservationists draw up an inventory of structures worth safeguarding. These selected buildings are protected from what preservationists consider to be inappropriate change. It seems that you do not adhere to this notion of preservation. Rather than arguing for an authoritative, conservation-worthy, memorable inventory, you seem to argue for a vitalistic remodeling and reshaping of all buildings in the city. UF: Not exactly. We do care about the value of buildings, yet we see this value as being determined not by what is but what could be. The possibilities inherent in a building are what determine its value. Certainly there are cases when it is appropriate for a building to be protected, conserved, placed under acrylic glass, embalmed. However, such buildings are not of much interest to us. As architects we are interested in buildings that become valuable because of what can be done with them. The possibility of a work of architecture, especially its ability to instigate further action, is not limited to that particular work, but includes its effect on other places. For instance, we think that every building by Karl Friedrich Schinkel should be preserved. But we also think the qualities and values of Schinkel’s buildings must be measured by their potential to become something else, to influence other architecture, elsewhere. JL: We certainly disagree with the Venice Charter and its support for the “musealization” of cities. And we try not to differentiate between high and low culture. But we are not opposed to differentiating the value of buildings per se. We engage urban oddities as a kind of critique. When we promote a continuous elaboration of the city, we are interested in the refinement of culture. Such refinement comes from an exhaustive observation of places that appear banal. That is why Hermann Czech is such an inspiration to us. His attention to what appears to be mundane is the basis of his architectural practice. It is how he gains insight into the cultural knowledge with which these unremarkable things and situations are charged. The subtle development of meaning from what appears meaningless—this is the high art of architecture. This is why we ask our students to look at the world in its smallest details rather than aiming immediately for the grand plan! UF: Create your own image of a building and get excited! Forget about what has already been mentioned in a book! And if the building and what you see in it is really good, you will be able to excite others with it as well. In this way a building can suddenly gain value over the course of a semester and the discourse among the students. As soon as a student works with a building in an interesting manner and presents this work to the group, new qualities about the building become perceptible. As a result, the students are contributing to a discourse. So along with developing their own projects, they are generating a collective architectural value system. C: Going back to the issue of historic preservation: [ . . . ] The students’ projects don’t seem to originate in the present, just as one cannot really tell whether Peter Märkli’s buildings were designed in the 1950s or at the turn of the twenty-first century. How did the students relate to the issue of contemporaneity? JL: There is, of course, a temporal dimension to the relentless development of a city in which buildings are continuously being changed andmodified.[...] An example of the kind of architecture we were considering was a flower shop near the Oberbarmen train station. 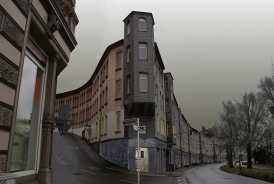 Of all the many great examples of existing architecture our students found in Wuppertal, this is one of our favorites. The flower shop illustrates just how different forces can lead to a softening of building types and the creation of bastards. You have the typical Bergisches Haus with two floors, clad on the exterior with Rhine slate. But over the course of time and through the process of urbanization, the modern architecture of the nineteen-seventies found a place for itself in the building, adding tinted-glass balcony balustrades, large stained-wood windows, façade elements reminiscent of Egon Eiermann, and “BLUMEN” spelled out on back-lit cubes. 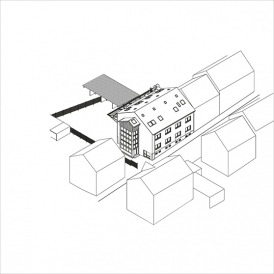 Making the most of the topography, four floors and retail spaces were added. The old and the new were virtuously combined, and the back of the house was connected to a small greenhouse and garden. [ . . . ] The building of the flower shop in Oberbarmen is an excellent object of study. The only problem was that it was perfect, and there would have been nothing for our students to add or remove in the course of the studio project. C: During this conversation, you’ve spoken about your take on individual buildings and about how peculiar but also seemingly banal structures can inspire you to undertake architectural interventions. Conversely, how do you relate these individual architectural interventions to the city? [ . . . ] What, to you, is the relationship between architecture and urban design? UF: Arriving in a city like Wuppertal is a little like arriving in a gray city in Poland. You arrive by train at the station at, say, 6:30 in the morning in the year 1987. A gray city. You are overwhelmed by the feeling that you are not able to buy anything anywhere and that you might starve to death. You fear people will let you die in a roadside ditch. But gradually you realize there is a kiosk. At the kiosk, you buy a plan miasta, a city map. It tells you how to find a bar mleczny, a milk bar. You go there, order pancakes and soup, and then you start to feel at home. So within half an hour, your perception of a city has fundamentally changed. From the very beginning, we wanted to work with the city as a whole. Wouldn’t it be elegant if we succeeded in changing the city, bit by bit, by transforming individual buildings so as to enable new perspectives of the city, through a kind of bar mleczny-moment? As architects, we can learn from film, photography, and painting. We can learn how to generate the impression of a place by means of a few carefully edited frames. 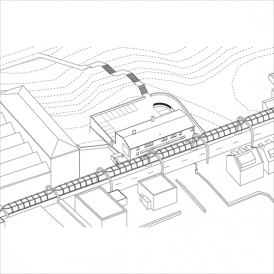 Is it possible to undertake targeted architectural interventions based on similar principles? What are the possibilities that architects have for changing their cities? ?The tactics used in urban design should consist of being aware of the transformative potential of one’s own architecture on the city, so that outsiders, too, begin to see the city differently. In the best of all possible worlds, viewers and users of that architecture would be inspired to develop their own projects for the city. 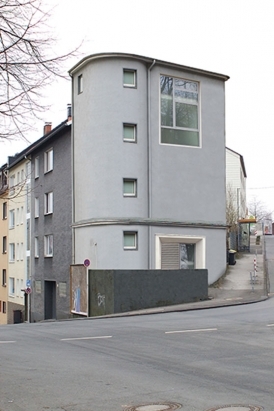 During the seminar and the studio in Wuppertal we tried to figure out to what extent one can affect the city as a whole by making small adjustments to individual buildings. These are issues of a prospective architecture. 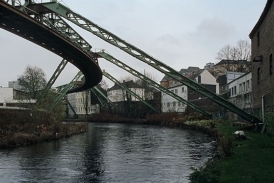 UF: On our very first strolls through Wuppertal it became clear to us that only an incorrigible pessimist could fail to see that this city has a future. The city’s buildings, its location, its floating tram—even if one cannot sleep near it because of the incessant screeching—all of this in between lots of empty shells left by giant snails who are now long dead. Our enemy—if it makes sense at all to speak about an enemy here—is the cynic. We wanted students to love their city. Either they must love it already or they must work on it lovingly or, at the very least, they must learn to love it. A vacant supermarket on Kaiserstrasse in Vohwinkel. Techniques: breaking open, grinding off, juxtapositioning. 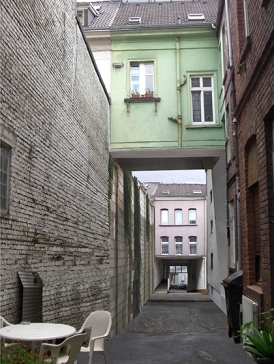 Wuppertal has the highest concentration of art collectors in Germany. found. It is surrounded by similar buildings, appearing familiar yet alien. Who lives here? Wupper River and Floating Tram. The Wupper River has no tourist boats. Nor is there a waterfront or cafés with panoramic windows. 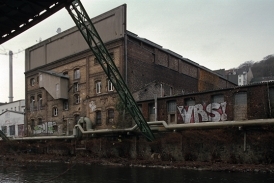 The buildings along the river only have plain walls facing the water. But a floating tram elegantly follows the curves of the river continuing right into Fritz Lang’s Metropolis. Community Center for a Christian Church. assembly hall with a mezzanine. mirroring the original. Techniques: clearing out, perpetuating, cloning. The former municipal transportation services of Elberfeld maintained a large, vertical stable for horses with a multi-toried ramp used as the main circulation element for the animals. Later, it housed an indoor tennis center and a boxing club. Inspired by the building, Julia Scherrer will convert it into a school with a fifty-meter shooting range. Large city blocks have been subdivided, walled up, detached. “Wuppertal” is a name created in 1930 to give a collective identity to the smaller towns of Elberfeld, Barmen, Ronsdorf, Cronenberg, and Vohwinkel. With Two-Face, Osman Seven renovates rows of building façades, making them appear architecturally related, creating overarching connections even though such connections between the buildings never existed. He makes it seem as if the English town of Bath has a sister city on the Wupper River.